Camden Lakes Homes: This home has it all. Great family, entertaining, fun, ready to move in home. This five year new home has way too many options and upgrades to mention here, down to the travertine backyard pavers and high voltage electric car charging outlet in the garage. You must see it for yourself. Full home impact glass windows and doors keep you safe and quiet. Schedule your personal showing today. Camden Lakes Homes: H.13963 - March 8th Price $649,900. An IN TOWN newer 5 bedroom, 4 full bathroom home west of Livingston Road in Naples with a private fenced backyard, custom gas heated pool with a prime “In-town” location just north of Delasol. Camden Lakes was built by Pulte just a few years ago. Widely coveted for the quiet and convenient location and the remarkable wide open interior floorplans. This is a one of a kind “Continental” plan, upgraded with more sq footage and special features. Spacious interior also includes bonus room with custom built-ins and a fitness room off of the master suite. Gorgeous island kitchen with quartz counters, gas stove, walk-in pantry. Also on the ground floor is a guest bedroom and full bathroom. Tranquil backyard with outside living spaces that include a front porch and spacious rear patio with custom built pergola. 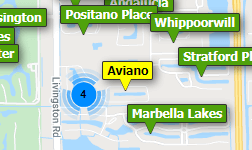 When comparing the home to others in Naples, be sure to start here to avoid the headaches of being east of 75. Easy commute to offices, schools, beaches, shopping and dining. Camden Lakes Homes: Amazing home at a bargain price. OPEN THE VIRTUAL TOUR AND WATCH THE MOVIE. More valuable than anything I can say in this paragraph. You will be experiencing a personal tour through this beautiful home and you will understand the value. Walking through the Front Door you will be blown away at the Magnitude of the main living space with a beautiful lake view. Sellers added a second Center Island to the Gourmet Kitchen which expands the kitchen into a huge cooking & entertainment area. The custom paint and crown molding work together to give this home’s interior a WOW factor in every room. The Master Bedroom has a beautiful lake view and a very spacious master bath. Three car garage for both cars and one toy. LOTS OF ROOM FOR A POOL but this home is priced to give you the option of choosing your own design. If you are looking for potentially the best home in Naples for $630,000......make an appointment today and come see this meticulously maintained home. Camden Lakes Homes: Sprawling, rarely available newer home with natural gas west of I-75! (Avoid all of that traffic east of I-75!) With room for many and a warm, welcoming atmosphere, with its rich wood flooring and cabinetry, and great room concept, this home is one where the kitchen is the heart of the home. Kitchen boasts gas range, stainless steel appliances, huge counter height island and loads of seating and lounging areas. Loft upstairs completes the fabulous living space, the first-floor den can serve as an optional 5th bedroom, and the second-floor laundry room makes it easy living. Loads of closet space, lovely screened patio off rear, freshly power washed roof, super location across from clubhouse, easy walking distance to A-rated schools, and huge yard complete the package. Light, bright and neutral, this home is a super entry level opportunity in Camden Lakes. This community offers an amenity-rich, low fee experience with its beautiful clubhouse with kitchen and state-of-the-art fitness center, covered picnic pavilion, full basketball court, resort-style pool and spa and fire pit. This home is located directly across from these fabulous amenities. Camden Lakes Homes: Looking for the perfect home North Naples location, kid friendly neighborhoods, gated and low HOA fees? Look no further! This immaculate home is picture perfect. Amazing upgrades and updates through-out that feature beautiful granite countertops, natural gas community, crown molding, tray ceilings, 8 ft doors and custom fixtures throughout. Added Bonus with 2nd floor family room, 4th bedroom and bath, reverse osmosis system, new HVAC system with a soft-start system. Contemporary charm, classy and inviting, this is living at its finest. Situated on an oversized fully fenced lot for your furry friends and huge upgraded extended Lanai. Location, location, walking distance to A Rated schools including Veterans Elementary and North Naples Middle School. Bike or walk to the new Seed To Table Market coming soon, Minutes to the beach, I-75 and Shopping! Camden Lakes Homes: This thoughtfully-upgraded, Camden Lakes home has been meticulously cared for! The Martin Ray model presents with enviable, first-floor functionality: a master suite offering customized walk-in closet, large shower, dual sink vanity & private water closet; guest room & 2nd full bath; den; dedicated laundry room; mudroom & 3-car tandem garage with workshop. Kitchen offers gas cooktop, raised-height dishwasher, large single-basin sink, granite counters, soft-close wood cabinetry & butler’s pantry plus walk-in pantry. The home’s layout was further enhanced with a full loft offering 3rd bedroom, full bath, large bonus room & storage aplenty. Length was added to both the garage and covered lanai and the paved driveway was widened to allow for easier parking. This homesite provides a deeper than average backyard with plenty of space to add a pool, if desired. Relax & watch television on your screened lanai. You will not be disappointed with the lifestyle offered here - inviting amenities such as a heated resort style pool, fitness center, social room, catering kitchen, outdoor grill, fire pit & basketball court. Top rated schools close by & easy access to shopping, dining & the beach. Camden Lakes Homes: Gorgeous Two Story 2015 Martin Ray floor plan home loaded with upgrades. LOW HOA FEES! Shows like brand new with chef's kitchen and gas appliances, wine cooler, tray ceilings, oversized shower in MBR and 3 bedrooms with office on lower level. The second story boasts a huge bonus room, large bedroom and full bathroom. Lovely curb appeal with added stone exterior. Camden Lakes is centrally located on Livingston road in a highly desired school zone. The beautiful resort style community pool is just steps away. Don't delay and make an appointment today. Camden Lakes Homes: Situated on an over sized lot in Camden lakes, this home has been well taken care of by the original owner. Large bedrooms with wood floors throughout. Enjoy the gourmet kitchen with a large island and plenty of storage, open to the living room and dining room there is plenty of space to entertain. The large living room opens up to an extended paved and screen in patio area over looking a large fenced back garden. Lots of room to add a pool for the new owner or ample space to let your pets run safely in the yard. Walking distance to the community club house and pool. Great location and in a very good school district. $75,000 in upgrades including custom closets, wood floors, 8 foot doors, crown molding, now is the time to get your piece of paradise. Camden Lakes Homes: Absolutely beautiful Martin Ray model, 3 bedroom / den; approx. 2100sq.ft. UPGRADES GALORE! Granite and tile, impact glass throughout, 20KW whole house generator. Upgraded appliances including a stainless-steel Samsung 4-door refrigerator. Additional cabinets in the laundry room and extended kitchen. Custom closets in the pantry and master closet. Coastal blinds in the living room, kitchen, front entrance, office and bedrooms. Electrical upgrades include flood lights in the rear of the home, kitchen pendants, fans and ceiling can-lights. The garage area has been extended by 4'; along with additional lighting and electric receptacles. This is one of the few communities in this area that offer natural gas which powers the cooktop/oven, dryer, tankless water heater, and generator . The amenities include a resort-style heated pool, well-equipped fitness center, clubhouse with catering kitchen, fire pit and BBQ Grill with picnic pavilion. You will enjoy low Collier County taxes and LOW HOA FEES. A quaint community with 156 homes in North Napes Convenient to I-75, 4 spectacular malls, SWFL International Airport and Collier’s highly rated schools. This is a MUST-SEE HOME! Need professional assistance selling your property at Camden Lakes Naples? Find out how an Area Specialist can help to generate more property exposure in order to get the most money for your investment in the least amount of time.